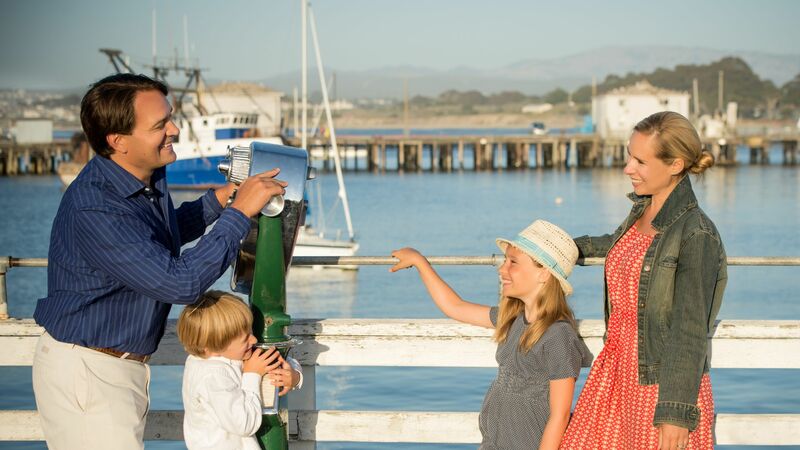 Explore all Monterey, CA has to offer for kids during your next family getaway! From paddle boats on Lake El Estero to discovering all the wanders of the Monterey Bay at the world famous Monterey Bay Aquarium. Learn about the Portola Pirate Program - Portola Hotel's kid-friendly loyalty program for children 3 to 12. The renowned Monterey Bay Aquarium is open seven days a week and a marvel of an attraction. Tickets are available for purchase at the front desk & concierge desk for guests staying at the Portola Hotel & Spa. Discover the beautiful Monterey Peninsula pedaling a bicycle along the recreation trail, around the rocky shores of Pacific Grove and into breathtaking 17-Mile Drive. Or explore the kelp forest and abundant marine life along Cannery Row or Stillwater Cove from an ocean kayak! Rent a kayak or take a guided tour. Try something new with their stand up paddle boarding and experience this new sport! Bring the buckets, shovels and boogie boards to Del Monte Beach within walking distance from the Portola Hotel & Spa. Located on Washington Street in Downtown Monterey; the MY Museum provides an environment unique to any other in Monterey County. This 8,500 square foot museum is packed with a variety of hands-on exhibits, making each visit unique and exciting. This famous playground is known throughout the state for its whimsical equipment, which includes a drinking fountain inside the mouth of a lion, a swinging rope bridge, a roller slide, and a life-sized hedge maze, among others. Walk from the hotel to one of Monterey’s landmark locations, including a skateboard park and a baseball park with group BBQ facilities. Kids love powering their own paddle boat on Lake El Estero, a freshwater lake surrounding Dennis the Menace Park. Do the kids need to burn off some energy? Take them to Monterey’s Jump-N-Around, featuring 6000 square feet of inflatable fun, Velcro walls, giant slides, bounce houses, bungee runs, boxing rings, video arcade, air hockey, private parties and more! Do your kids like to climb? The Sanctuary Rock Gym provides learning on how to boulder, top-rope or lead climb. A high quality, creatively designed mirror maze walk-through is the feature attraction at this family attraction. No matter what your age you will love getting lost in our psychedelic setting, complete with high tech lighting and pumping music. It’s a great opportunity for families and couples to solve this challenge together. Jump, crawl, climb & sliver your way through an obstacle course of brilliant green highly, sensitive lasers radiating from the walls of the bank vault. Walk along and shop at Del Monte Center. Once you are done, head to the movie theater and watch that new movie you have been dying to see. Visit Pacific Grove, CA's Monarch Butterfly Sanctuary and experience the beauty of this natural butterfly habitat. Visit November - February. Wild Things, Inc. is home to a variety of animals from elephants to lions to parrots. Providing tours and dedicated services for professional movie features involving humanely trained wild and exotic birds and animals. The Boardwalk is a half-mile long historic park next to Santa Cruz's mile long main beach. It includes more than 34 rides and attractions and features two national historic landmarks. The Exploration Center showcases the amazing habitats and wildlife found in the Monterey Bay National Marine Sanctuary through educational multimedia exhibits, interactive remotely operated underwater vehicle, and theater presentations. Free admission, open Wednesday - Sunday, 10am to 5pm. Gilroy Gardens Family Theme Park is a one-of-a-kind experience combining four unique gardens and amusement rides with the mid-20th Century history and agricultural roots of Santa Clara Valley.